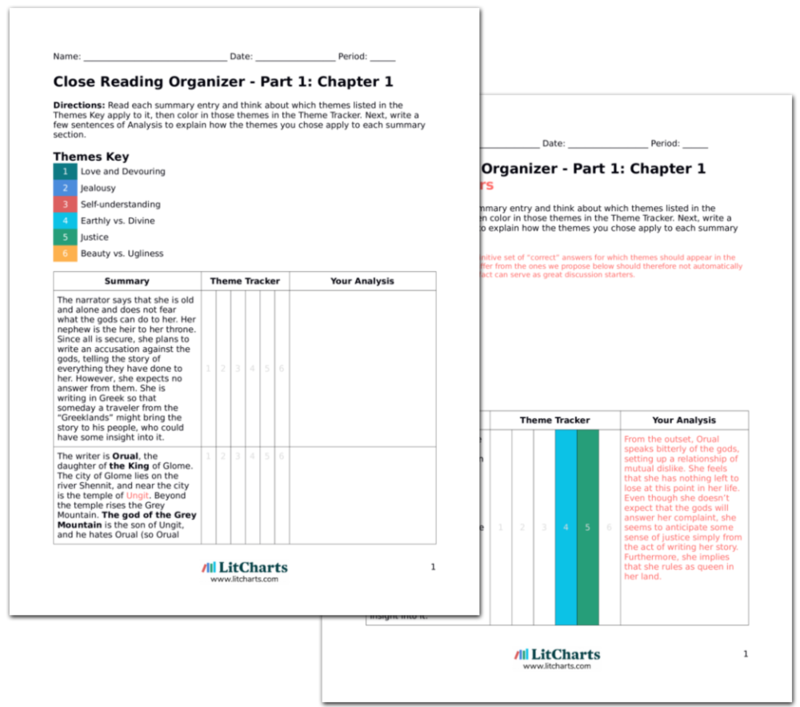 LitCharts assigns a color and icon to each theme in Till We Have Faces, which you can use to track the themes throughout the work. Before long, Orual is well enough to be up and about, but she hides this from the King so that he won’t make her do work for him. The King speaks as though he loved Psyche very much, and now he’s left with the two daughters he hates. The King changes the past to soothe his own guilt, much as Orual herself will do to hide the destructiveness of her way of loving. Still, Orual receives only abuse from her father. Orual plans for her journey to the Mountain. She doesn’t know how to ride a horse, so she’ll have to walk; and since she doesn’t know the way, it’ll take a long time. She’ll have to spend a night on the Mountain. She puts the journey off because she doesn’t know what she’ll do afterwards. It seems that once she has dealt with Psyche’s remains, the part of her life with Psyche in it will be entirely gone. She can anticipate only a dark, empty future. Orual’s life has been linked so closely to Psyche’s that she can’t fathom living without her. At the moment, even the prospect of giving Psyche’s body its last rites seems like a sturdy connection to Psyche. Once Orual has done this, Psyche’s absence will be complete. Orual feels deeply depressed. One day, Orual sits in a doorway near the guards’ quarters. Seeing a fly crawling up the door, she thinks her life is like the fly’s mindless progress. Bardia appears and tells her that he, too, has felt the depression she feels. Only fighting in wars made him better. She proved she had a natural talent for fighting when she attacked him outside Psyche’s door, and he offers to teach her how to use a sword. Orual doesn’t see why she should learn unless he would kill her with the sword, but Bardia insists. Orual feels entirely lost and purposeless in her grief, and is even somewhat suicidal. Bardia will be the one to show her the benefits of hard work as a distraction from her mind, which she will make use of for the rest of her life. Neither Bardia nor Orual seems to see any obstacle to swordplay in the fact that Orual is a woman, though it’s certainly not conventional for women to fight in Glome. Bardia equips Orual with a shield and tells her to use it as a weapon. He gives her a sword and shows her how to hold it and how to stand. He teaches her for half an hour, and it’s so difficult that she can’t think about anything else. Bardia compliments her work. When the lesson is over, Orual goes across to the dairy to drink some milk. She overhears Bardia tell another guard that it’s too bad Orual is ugly, but if a man were blind she would be a good wife. This is the closest Orual ever comes to having someone declare their love for her. Psyche and the Fox are the only people who have truly been kind to Orual up until now, but at this point Bardia becomes another faithful friend. As kind as he may be, he’s still affected by Orual’s ugliness. The fact that Orual has never come closer to a declaration of love than Bardia’s cold appraisal gives her reason for her clinging, jealous love. When love is so hard for her to find, she will closely guard any she receives. Orual takes lessons from Bardia every day, and it makes her feel better, although she still grieves. She tells him about her plan to go to the Mountain, and he offers to go in her place. When Orual insists she’ll go, he offers to go with her to give guidance and protection. They’ll ride one horse together. Orual worries that the King will keep him from going, but Bardia tells her that the King understands soldiers much better than he does women, of whom he’s almost afraid. Just as Orual and Bardia both wanted to be able to die in Psyche’s place, now they both want to give her a proper burial, showing that their loyalty follows similar lines that will make them a close pair for life. Orual has long feared her father, and Bardia’s insight is the first indication she has that he might actually fear her as well. This fear will become more apparent later. Six days later, Orual and Bardia set off early in the morning. Only the Fox and Orual’s servants know of their journey. Orual wears a sword at Bardia’s insistence, and they share a horse. The city is quiet. They pass the house of Ungit, which is built with huge stones in an oval shape. No one knows how the stones got there. The roof is domed, so that the building looks like a slug. The shape is supposed to resemble the egg or womb that created the world, and in the spring, the Priest of Ungit ceremonially battles his way out of the temple to birth the new year. The resemblance of Ungit’s temple to an egg or a womb shows that she is first and foremost a fertility goddess. The fact that the Priest must fight his way out of this womb contradicts the conventional view of a womb as a safe place and suggests that Ungit jealously keeps her worshipers by her, so that they must fight to escape her clutches. This view will later resonate with Orual’s own way of controlling those who love her. Orual feels better once they pass the house of Ungit. She has never been this way before, and she sees dawn coming. They pass the road by which Psyche was taken, but they take a shorter way, riding up to a ridge. On top of the ridge, there is warm sunlight. The Mountain sits across a huge valley, looking hardly real. Orual can see all the way to the sea, and all is still. Orual thinks she can escape Ungit’s power by leaving her physical territory, for she doesn’t realize that Ungit’s influence lies within herself. This journey takes Orual beyond where she has gone before, and she finds that the world is more beautiful than she thought. Orual struggles because she feels inclined to be happy and must tell herself all the reasons she shouldn’t be. The view makes her feel that she could wander the world, and the life around her makes the world seem much better than she thought it could be. She almost can’t even believe she’s ugly. As they continue on, she tells herself she can’t feel this way as she’s about to bury Psyche, because it makes it seem that she doesn’t love her. She knows too much of the world’s evil for the scenery to make her think it’s beautiful. The gods always make humans think everything is wonderful before they send more pain. Just as Orual couldn’t accept Psyche’s calm in the face of her death, she can’t accept her own happiness while traveling to bury Psyche. Orual seems to think that her love—and thus, her grief—must completely consume her for it to be real. Allowing any positive emotion in will make her doubt her own devotion, and her devotion to Psyche is just about the only thing she can take pride in. She thinks everything must be black or white: She knows the world is awful, so there can be nothing good to find in it at all. When they reach the last ridge before the Mountain itself, it’s very cold. A dark, forbidding valley lies below them, and the Mountain rises in towers of black stone. Orual no longer has to battle happiness. Bardia points out the Holy Tree. They descend into the valley on foot and climb towards the Tree. Orual fears that she won’t find Psyche’s remains. When they reach the Tree, they find chains hanging from it, but nothing else. The Mountain seems to hold some dark power. Significantly, Orual is more frightened by the idea of not finding Psyche’s bones than of finding them, though their absence could indicate that Psyche is still alive. Orual would rather be able to reestablish control of Psyche’s body than not know what has happened to her. Bardia says that the god must have taken Psyche, because no animal would have been able to get her whole body out of the chains, and it would have left some remains. Orual feels that her journey was in vain, but suggests that they look around. Eventually Bardia calls her over to show her a ruby he’s found, one that Psyche wore to her sacrifice. Bardia believes they have found proof that Psyche has undergone some interaction with the gods, but Orual feels only her own sense of misdirection, rather than any wonder at what Psyche might have experienced. Orual insists that they keep searching in this direction. Bardia wants her to stay behind because no one has ever been to the other side of this ridge, and they’re very close to the dangerous, holy part of the Mountain. Orual wants Bardia to stay behind, since the gods can’t hurt her more than they already have, but they agree to go together. Bardia goes back to get the horse, and they continue on carefully. Though Orual and Bardia have different attitudes towards the gods, they agree that the gods are dangerous to humans, and holy places should be avoided if at all possible. Additionally, Orual and Bardia show themselves to be on equal footing in terms of heroism, as each tries to protect the other. This will be a trend throughout their relationship. They find themselves at the top of a steep slope leading into a gorgeous, green valley. As they descend, it gets warm. Bardia wonders if this is the god’s valley. At the bottom, Orual is about to drink from a stream when she hears two people cry out and looks up to see Psyche standing on the other side. This valley, apparently divine, contrasts deeply with the barren landscape of the valley they have just come through, which seems to lie on the edge of mortal territory. The difference is one between the ignorance and blindness of humans and the life-giving power of the gods. Greider, Julia. "Till We Have Faces Part 1: Chapter 9." LitCharts. LitCharts LLC, 17 Feb 2017. Web. 18 Apr 2019. Greider, Julia. "Till We Have Faces Part 1: Chapter 9." LitCharts LLC, February 17, 2017. Retrieved April 18, 2019. https://www.litcharts.com/lit/till-we-have-faces/part-1-chapter-9.